Blooming Goodies is a family-run operation. Four generations come together every week to pick traditional Asian produce on four acres of land near Oregon City. One of the hardest parts of the job, according to Mary, is an issue any backyard gardener is familiar with — controlling insects without using chemicals and sprays. Mary’s family noticed that Oregon customers seek out spray-free, organic vegetables. One of her tricks is to water before dawn, wetting the leaves which she says discourages the insects from munching on them. 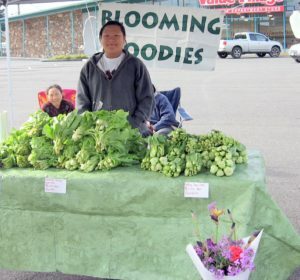 Visiting the Blooming Goodies booth at the Hollywood Farmers’ Market, you will notice that they offer produce you can’t find at any other stand — baby bok choy, Thai basil, snow peas, Asian cucumbers, French long beans and even squash leaves. Don’t hesitate to stop, take a closer look at that interesting bundle of greens and ask what an item is or how to cook with it. Mary fields these questions regularly and might suggest that you add those pumpkin leaves to a soup or steam or stir fry them with other vegetables. Blooming Goodies produce is only available at local farmers’ markets, so visit them this weekend!